When I moved to my current home seven years ago, I noticed a big tangle of vines with chartreuse foliage growing at the base of one of the deck posts. Thinking it was a cultivated something, I pounded some stakes into the ground and ran sturdy strings from the stakes to the deck railings, fifteen feet (5 metres) above. By then I had figured out that I had a female ‘Aureus’ hops vine (Humulus lupulus 'Aureus'), which has chartreuse foliage in spring that changes to medium green in summer. The twining hops vines ran up the strings more than a hand’s length each day, and were tumbling over the deck railing within three weeks. Sharing company with this kind of exuberance is just plain fun, and it gets better. Worldwide, at least 135 species of butterflies and moths use hops as a larval host plant. At my house, vivid question mark butterflies (in photo) think I’m growing hops just for them, because they use the vine as their nursery in late summer. Yes, butterfly larvae chew holes in the leaves, but considering how hard it is for butterflies to find host plants these days, I’m happy to see caterpillars that will morph into question mark and red admiral butterflies munching happily on the hops, which has leaves to spare. Growing hops as an herb is worthwhile, too. In late summer female plants produce cone-like flower structures, which dry to a beautiful pale green colour. For centuries hops have been used medicinally for everything from toothaches to tuberculosis. Bitter compounds in hops do have antibiotic properties, but I wouldn’t describe them as tasty. In fact, my favourite use for dried hops cones is to combine them with lavender and stuff them into "sleep pillows" small enough to tuck inside a pillowcase. I don’t know if hopped-up sleep pillows really help me sleep better, but they sure smell good! An established hops vine will produce many more shoots in spring than it needs, so about half of them can be gathered as a rare seasonal vegetable. The leaf buds (shoots) can be poached in lemon water and served like asparagus, or pickled in a spicy vinegar brine and kept in the refrigerator. Hops shoots have been called the most expensive vegetable on earth, and I have seen a large jar of pickled hop shoots priced at $42 (€32/£26). Yes, they taste good, with a bitter herbal punch, but the high price is due to the short season for hops shoots, which are thinned from established plants only in late spring. About 800 AD, some medieval monks discovered that hops made beer keep better, but farmers in northern Germany were the first to start growing hops for flavouring their beer. Until then, various bitter weeds and bog plants had been used in beer making, but hops were clearly better. They were also taxable. In 1710 the English parliament passed a penny-a-pound tax on hops while also requiring that all beer be made with hops. This move redefined English beer as a hop-based brew. These days there are dozens of hops varieties developed for brewing beer, and some beer makers like to blend different varieties together. But when it comes to growing hops at home, choosing a variety that is grown locally – or at least regionally – is usually best. There are spicy, cold-hardy varieties from northern Europe, resinous to fruity varieties developed in the American northwest, and a huge range of English hops, from the widely grown ‘East Kent Goldings’ cultivar to ‘Challenger’ and other varieties with more bitterness. Commercially, hops are grown in "hops yards" where they are trained to grow up tall posts, but because they need little ground space, growing hops works well in urban and suburban yards, too. A few years ago, London’s City Farmers organisation came up with a great idea – get hundreds of home gardeners growing hops, and use the hops to create a true community beer. The Crystal Palace area is now dripping with hops. This sounds like great fun because it makes growing hops an activity to be shared among neighbours, some of whom may be thrilled to host alarmingly colourful peacock butterflies on their hops vines. Indeed, after living with a robust hops vine through several seasons, what I most admire is the energy and vitality of this multi-talented plant. Gardeners who share my fascination with all things green should put "growing hops" on their life lists. "Hi, do you have guidance on pruning? My plant is in it's second season, should I cut it back in the Spring?" 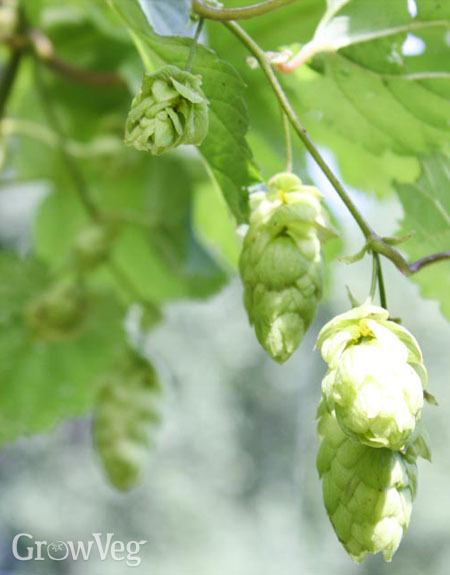 "Many people cut long branches when harvesting their hops, because it's easier to clip off the cones that way. The remaining foliage will die back after a couple of hard freezes. All of the dead vines can be gathered up and composted in winter. If your winter is so mild that the vines are not being winter-killed, I would cut them off at the ground in December. New growth will emerge from root buds in spring. " "I have had a hop in the garden fir many years but it diesnt do anything. About 5' of feeble growth. It is under a tree is this the problem should I fertilise it with manure? Would love to get it gping as I had hooed it woukd grow round our summerhouse." "We use hops for a southern sun block growing on an arcade 2.5 meters from the house. It works as an air conditioner, but it's "free". No watering, no soil modifications (sandy soil) and it grows very well. It is a bit of a thug and will take over things you don't want covered, and it will want to colonize your yard, so be careful when planting as shown -near vegetables.It may work well this year but next you may be fighting the sorcerers apprentice! "